The sailing ‘rig’ consists of all the mechanical apparatus which is attached to the hull in order to assist in the propulsion of the boat. This includes a boat’s masts, sometimes referred to as ‘spars’ and all of the cordage - which are the ropes and other types of line or yarn used to hoist the sails. Different types of rig are associated with different types of boat, e.g. a ketch or a schooner, and all have different aerodynamic properties which make them more suitable to certain types of boating. For example, a rig on a boat that you’d use on the sea for racing will need to possess different aerodynamics than a boat used primarily for cruising purposes. How Do You Choose The Best Type Of Rig? What it is important to note is that the ‘rig’ itself will be fitted according to the design and manufacturing process of the boat itself and there will be different types of rigs on boats of different sizes based upon the primary purpose for which the boat is to be used for and the overall design and layout of the boat itself. Therefore, if you’re living on a sea-faring boat, it’s not a so much a case of choosing the right rig from a number of different types, as whichever boat you choose, you’re going to be using it as a cruising vessel not as a racing one, it’s more a case of choosing the most appropriate boat that meets your needs in terms of how its designed - the number of berths it has, its galley, etc - basically whether it meets your needs for the kind of lifestyle you’re looking to achieve and the rig will simply be a functional part of that overall set up. What you will need to consider, however, is making sure that whoever will be operating the boat is capable of handling the particular rig in question in terms of the maximum size of sail they’d feel comfortable handling. On all but the very smallest of boats, the popular choices of rig tend to be either a sloop, cutter, split rig e.g. ketch/schooner. A sloop is probably the simplest to operate whilst the benefits of a split rig for a ketch, schooner or cutter means that the rig is split up into separate smaller, more manageable areas of the boat. With a split rig, this limits the size of the main sail which allows for easier handling which might be useful if you have less experienced people on board, such as teenage children as an example, who may want to get involved with the sailing process themselves. 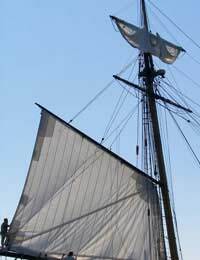 A ketch is able to sail under mizzen and headsail alone whilst a cutter rig offers an easier headsail downwind option which can be useful in a heavy weather situation. There’s also a junk rig which is often the preference of those who are sailing single-handed or have smaller hands as it is easier to control and has fewer control lines. This article really covers the basics. For those who intend to live on a sea-faring boat, you’ll almost certainly have the knowledge, experience and confidence through having already tried your hand at using different rig set ups. Then, it’s a simple case of determining which is your best option for the type of boat that meets your needs and how and where you’ll be using it. And, if you’ve got any doubts, a good yacht dealer will be able to offer you further advice.